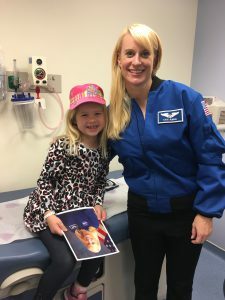 When you receive a phone call from the National Institute of Health stating that an astronaut who studied DNA in space for four months would like to meet your daughter, you pause. You breathe. You realize the gravity of the moment that has been presented to you. You are in awe. You make it happen. Kelsey and her brother were able to meet Dr. Kate Rubins, the first astronaut to sequence DNA in space, and it was as amazing as it sounds. Kelsey was given an opportunity to speak with Kate and ask her questions one-on-one. Kelsey and her brother each read Dr. Rubins’ biography in advance and each came prepared with 6 thoughtful questions to ask her. The questions ranged from how did Earth look from the space station, what kind of food did you eat up there, were you ever scared, and when did you decide to become an astronaut? During the NIH Astronaut Presentation with over 400 audience members are 2,000 live streamers, I sat in true amazement of the moment. We were in reserved seating as we listened to a first-hand account of a four month space mission from launch to landing and saw that Dr. Rubins is making her dream come true. Over dinner, Kelsey announced that today was the best day EVER! She thought it was incredible that such a confident, intelligent, and clever girl wanted to meet her. As I listened to Kelsey recount the day and all that she learned about Dr. Rubin’s work and missions, I could not help but think that as well. Take a moment on this beautiful week to savor the sun and the beauty around. My sweet baby girl reminded me to do so this morning. “What is it?” I said through foggy lenses. She was pointing to a reflection that the sun was creating on the wall. There it was, glistening with every color of the sun. The only way to describe the colors and the patterns shining through the curtains is to think about the inner workings of a kaleidoscope. I would never have noticed it if she had not pointed it out. “Yes, Kelsey, it is.” It truly was magnificent. A morning reflection I would not have stopped to recognize otherwise. Stop and recognize the beauty today, bask in the light of the sun, and smile. My daughter endures so much, but she always stops to see the beauty in all around her. She teaches me so much every day. What grace! What enthusiasm! What fun! This inspiration from my six year old came shortly after the news that we are ceasing the daily injections for the time being. Words cannot express the weight I feel has been lifted from our morning routine and daily comfort. The overall result may have been full of joy, but interestingly, Kelsey first asked to continue the medication. Her daily pain was actually asked for by request. This medication must make her feel so great. The knowledge of that was powerful and difficult to discuss aloud. “I feel really good when I take it” was her rationale. That sound logic had me question the entire situation. So with the new relief comes a bit more worry. For now, I smile. I watch with amazement and a breathe a huge sigh of relief. The weekly injection seems easier knowing it will be another seven days before I have to give it again. Today, my daughter is my inspiration. Her twirl is sheer joy.